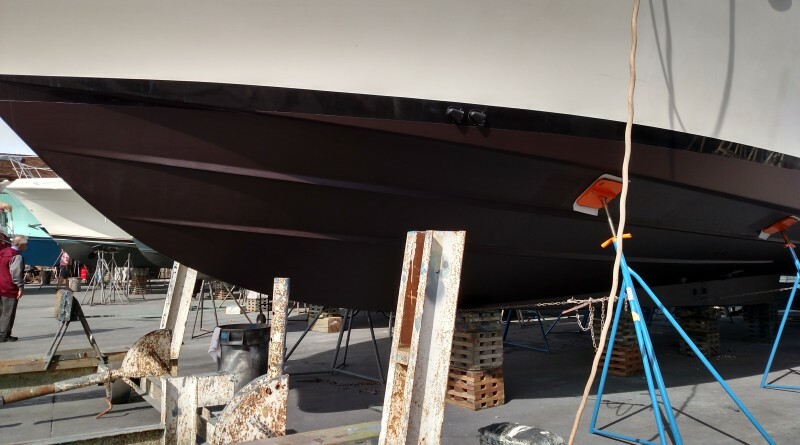 Burgundy sits on blocks at the boatyard, showing off her freshly painted bottom. Each time our boat needs a fresh bottom job we’re faced with the same questions: What’s the best, most cost-effective paint to protect the hull, yet do the least harm to the environment? Is more expensive, better quality paint a better deal when factoring in costs for hauling, hull prep and application, plus environmental concerns? Following research, only one answer is clear: the best bottom paint for our boat may not be the best for your boat. The choice of hull paint depends on the boat’s use, location and cleaning/maintenance regimen. A boat that’s used for racing likely needs a different paint from a cruising or fishing vessel or dock queen. Most boaters, I’ve noticed, really care about the environment. We want the water to be safe for aquatic creatures to thrive and humans to enjoy. Yet improving water cleanliness means reducing toxins, including the biocides used in bottom or antifouling paints to deter growth and adhesion of marine organisms on the hull. Copper, the most common biocide, works by slowly leaching out, inhibiting growth but consequently degrading water quality. Gradually, to help clean up polluted waters, the amount of copper government regulations permit is diminishing. Many paints, including previous more durable paints, are no longer on the market. Recently, to learn the latest in antifouling paint and to request tips on selecting paints, I visited Karen Holman, principal of the Planning and Green Port Department at the Port of San Diego, and Stephanie Bauer, their senior environmental specialist who focuses on bottom paint. The good news they shared is that, with the reduction in allowable copper, major marine paint manufacturers have developed new products that are much better for the environment, including biocide-free paints. The Port commissioned studies to gauge their effectiveness and determined that a number of non-copper-based paints performed well. These studies are available on their website, portofsandiego.org, under the Environment and Green Port tabs, along with a brochure on selecting an alternative hull paint. “The most beneficial for the environment is the non-biocide paint,” Bauer said, adding that it may be not appropriate – yet – for every boat. While the paints are steadily improving in quality, they remain more costly but may last as long as five to 10 years, compared to two to three years for traditional paints. As California Professional Divers Association President Bill Rocco explained, they also require more frequent cleaning. With over 50 antifouling paints suitable for and commonly used in Southern California, how do you choose? Holman and Bauer agreed the best recommendations come from traditional sources: fellow boaters, the diver cleaning your hull, boatyard managers working with bottom paints and knowledgeable paint company representatives familiar with SoCal waters. Key, of course, is finding a boatyard you can trust and asking a lot of questions. Enquire about paint application and the required number of coats. “Ask for a paint recommendation and see if they’re open to trying something new (an alternative hull paint). The more questions you ask the more likely the boatyards are to offer more information,” Bauer said. “If customers don’t ask, they’ll go with the basic (bottom paint) package,” Holman added. While this could be cost-effective, there may be a better choice for your boat and our beloved waters. Following a chat with our diver and online research, we selected a more durable, higher quality paint. To learn more, read the Port of San Diego’s brochure Boater’s Guide to Using Hull Paint in California, available at dbw.ca.gov, BoatUS Magazine’s article on “The Lowdown on Bottom Paint” and the West Marine catalog’s overview and comparisons of bottom paints.